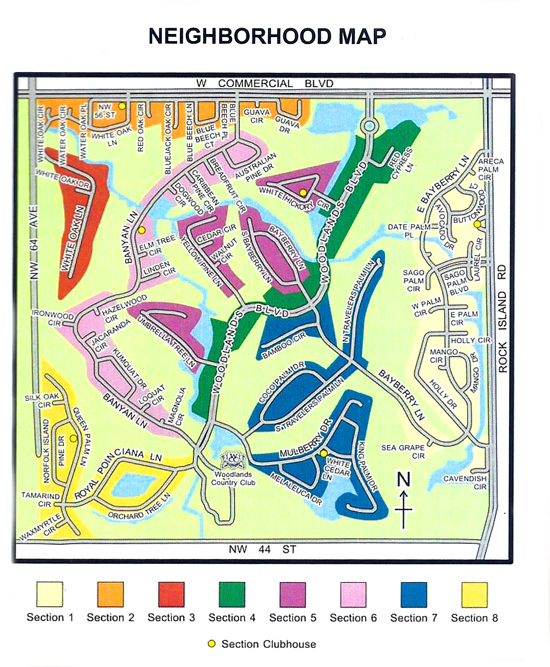 The Woodlands of Tamarac is a spawling golf community located in the city of Tamarac in Broward County, Florida. Just off Commerical Boulvard the Woodlands Country Club is home to over 800 homes. The community features a vast array of architectural styles, from numerous builders. The Woodlands Tamarac, houses elegant estate homes on oversized lots, along with more modest golf course and waterfront homes. Situated on two 18-hole championship golf courses, with ammenities that include clubhouses, swimming pools, and tennis courts. The community was started with the purchase of over 600 acres west of the Florida Turnpike. Strong demand for the first part of the community, with prices under $30,000 helped the community grow to over 5000 acres. The planned community was exactly what purchasers from all over the country who visited South Florida seeking their dream homes were looking for. Today, the same is true as many homes are undergoing renovation. Just west, off Commercial Boulevard in the City of Tamarac, the Woodlands Country Club offers exactly the South Florida Golf lifestyle that buyers dream of. Winding waterways, wooded areas, fairways and an array of amenities in addition to the country club itself, today part of Clublink, make the Woodlands an incredible value in South Florida real estate. At Eric Miller and Associates, "We're here to help" with your next Woodlands Country Club purchase or sale. Contact us directly at (954) 383-8170.